Earthly Labs has developed a ‘plug-and-play’ carbon capture device that allows craft brewers to capture the CO2 generated during production and reuse it in carbonation and packaging processes. Earthly Labs’ CiCi device is a refrigerator-sized carbon capture and conversion device designed to make carbon capture technologies accessible to small scale breweries. It’s ‘plug-and-play’ design means the device can be installed in existing brewing systems, eliminating the need to purchase expensive new machinery. The CiCi captures the CO2 that is naturally created during production processes such as fermentation, filters it, and converts it into commercial quality liquefied CO2 needed for processes like beverage carbonation – to give it the characteristic ‘fizz’. The system uses intelligent sensor technology and software that automates the capture process, optimising efficiency and maximising user-friendliness. These technologies have long been available to larger scale breweries, but Earthly Labs’ solution democratises carbon capture technology by offering a smaller and more accessible solution for small scale independent producers. Earthly Labs estimates that this technology can help breweries to reduce their CO2 emissions by up to 50%. In addition, through this circular model, they can reduce their CO2 costs between 50-100% by replacing commercial CO2 with repurposed waste CO2 produced in own brewing processes. It is estimated that the craft brewing industry emits nearly half a billion tonnes of CO2 each year, and purchases half this volume each year for processes such as carbonation and packaging. Earthly Labs’ CiCi is an accessible technology that can help brewers to simultaneously reduce their costs and greenhouse gas emissions by creating a closed loop system for waste CO2. They estimate that their devices are already preventing 150 million tonnes of CO2 from entering the atmosphere annually. The CiCi’s ‘plug-and-play’ design means that existing brewing infrastructure can be retrofitted to improve sustainability and reduce environmental impacts. The closed loop system facilitated by the CiCi encourages the use of waste as a production input, therefore cutting waste generation and reducing input costs. 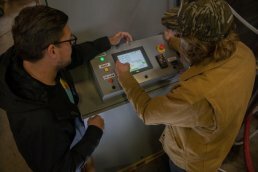 Earthly Labs estimates that the CiCi can reduce CO2 emissions from breweries by up to 50%, and aims to capture one billion metric tonnes of CO2 as soon as possible. Earthly Labs was founded in 2017, with the mission of bringing viable carbon capture technologies to independent craft breweries. Their aim is to capture one billion metric tonnes of CO2 as soon as possible.